No. 4 seed Florida Gators baseball (44-16) rebounded from an early loss to win four straight games and capture the 2015 SEC Tournament Championship. Florida defeated the No. 2 seed Vanderbilt Commodores 7-3 on Sunday in Hoover, Alabama, to clinch its seventh SEC Tournament title, first since 2011. 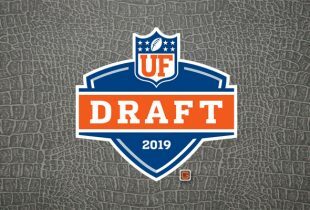 On Monday, the Gators were awarded the No. 4 overall seed in the 2015 NCAA Tournament. As such, Florida will host the Gainesville Regional and would host a Super Regional should it advance past the opening portion of the event. UF will host Florida Atlantic, South Florida and Florida A&M in regional play and would match up with the winner of the Tallahassee Regional (hosted by Florida State). With their backs against the wall, the Gators won four win-or-go-home games in as many days to overcome an opening-round loss and early trip to the loser’s bracket of the SEC Tournament. Florida had a bye in round one and dropped its second round game 7-6 to Arkansas in heartbreaking fashion early Thursday morning. UF faced elimination in every game going forward but did not falter, starting with an 11-2 victory over Auburn. Florida got revenge against Arkansas in a 10-0 run-ruled game and won a 2-1 thriller against SEC regular-season champion LSU in the semifinals. In Sunday’s finale, the Gators and Commodores endured two weather delays in the first three innings of play; UF led 2-1 during the first and 5-2 during the second, which lasted for two hours and 15 minutes with the teams in the bottom of the third inning. Junior right-handed pitcher Eric Hanhold (2.1 IP, 2 H, 2 ER, K, WP), the Gators’ starter, exited after the second delay as the UF bullpen was asked to fend off VU over the final six innings. 1. Setting the tone early: Junior left fielder Harrison Bader (1/5, HR, RBI, 2 R) followed up a 3-for-4 day against LSU with a leadoff solo homer in the title game. Bader was placed at the top spot of the batting order due to the absence of freshman second baseman Dalton Guthrie, who sprained his wrist in Saturday’s semifinal game. 2. Have yourself a day, Buddy: If Guthrie is forced to miss any more time, the leadoff spot might should go to sophomore center fielder Buddy Reed (3/4, 2 R, RBI, BB). Reed’s ability to do it all was on display Sunday, from his RBI double to left center to legging out an infield single with his eye-popping speed. 3. 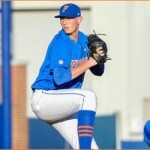 Lefties lead the way: When the Commodores threatened to get back in the game, Gators head coach Kevin O’Sullivan turned to junior left-handed pitcher Danny Young (3.1 IP, 2 H, 3 K), who earned the win as he carried Florida into the eighth inning as UF extended its lead to 7-3. As Young started to fade, O’Sullivan called on another southpaw, sophomore Kirby Snead, to close the game. Snead (1.2 IP, 2 H, 3 K) got it done, working out of a jam in the bottom of the eighth inning and avoiding trouble with two base runners in the bottom of the ninth. I saw the whole SEC Tourney including the Blunder that was the First Arkansas Loss. The guys came through in resilient fashion to battle back and go on a 4 Game win streak. The win streak included beating the #1 Team in the country. Our first 2 Starting pitching rotation is set with Logan Shote, and AJ Puk obviously I would wish we had a 3rd day starter set in stone which could be our Achilles Heel….. But, we have Depth and a great Bullpen. PS I’m proud of the boys despite several Base running blunders in the LSU game which could have caused us the game. I think we are hitting our stride and this little 4 Game winning streak could and should continue into the regionals….. GO GATORS!!!! great overall showing mistakes and all. They beat some quality teams and the #4 overall seed was deserved. Here’s hoping they keep the momentum rolling! GO GATORS! I have to admit, they caught me by surprise. I was about to post this team just isn’t consistent or a championship team after the horrible loss to Arkansas, and all of the other games they choked on through the year, losing the first game in the last 5 series or so, just consistently inconsistent. The offense just hadn’t been clutch, although powerful at times, so many runners LOB. Hopefully they will pleasantly surprise again and get to Omaha, although being the #4 seed, I think they again got very unfavorable draw, although at least their regional draw is more favorable by far than it was last year. Hopefully FSU continues its late season swoon and gets tagged in their own regional as UF hasn’t looked great against them except the very first game they played.